IN 2014 THE APE FAMILY FOUNDATION™ WAS STARTED WHEN TYNE JONES WATCHED RISE OF THE PLANET OF THE APES AND FOUND A PASSION FOR SAVING THE SMART CREATURES WHICH ARE CLOSE RELATIVES TO US. IN THE NEXT FEW YEARS TYNE DID SMALL FUNDRAISERS KNOCKING ON PEOPLES DOORS ASKING " WOULD YOU LIKE TO HELP SAVE THE APES?". LATER IN 2017 THE APE FAMILY FOUNDATION™ WAS OFICIALLY FOUNDED WITH LOGOS AND NAMES TRADEMARKED AND A BIGGER CHANCE TO MAKE A DIFFERENCE. SOON AFTER THIS TYNE MET JANE GOODALL THE RENOWNED PRIMITOLOGIST THAT REVOLUTIONISED HOW WE SEE CHIMPS AND OTHER APES TODAY AT THE ABCS Q&A. 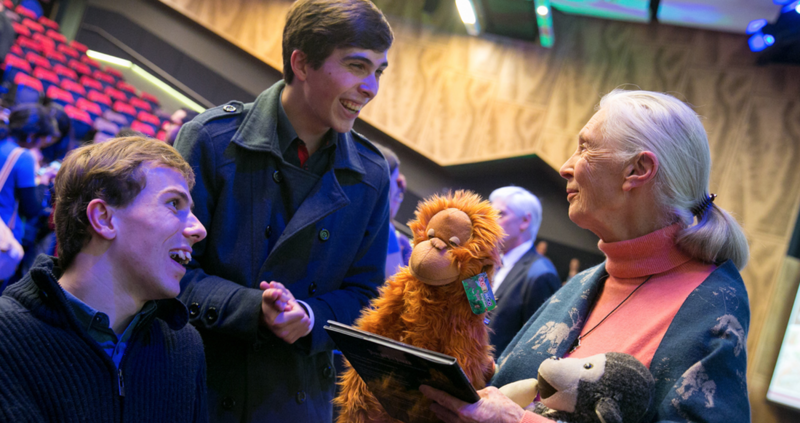 JONES ALSO MET GOODALL AGAIN LATER THAT WEEK AT MAQUARIE UNIVERSITY, ASWELL AS THE 2 CLARKE BROTHERS, DANIEL AND WILLIAM KNOWN FOR THEIR AMAZING EFFORTS SAVING THE ORANGUTANS ( FIND OUT MORE IN THE LINK BELOW). JONES IS STILL SEEKING MORE HELP FOR HIS EFFORTS AND IS STILL KEEN ON GETTING RID OF THE "ENDANGERED" LABEL FOR APES.